I’m excited to announce that the 3rd edition of “Effective C#” is coming out this month. Just in time for a Christmas gift for that developer on your list. This is the first major milestone in a large project: I’m updating both “Effective C#” and “More Effective C#”. The first edition of “More Effective C#” was released in 2005, coinciding with the release of C# 3. A number of the items covered LINQ and related language features. The second edition of “Effective C#” came up a few years later with C# 4. The new areas were dynamic support, and the PLINQ libraries. Then, I waited. I did not want to make more updates until Roslyn came out. The switch to the Roslyn compiler came with C# 6. Both books are somewhat out of date. They also aren’t organized for developers who did not start using C# with one of the earliest versions. The existing versions were organized based on the version that was current when the book was released. I took the opportunity afforded by updating both books to reorganize the content (all 100 items in both books). I believe that Effective C#, and the upcoming edition of More Effective C# are more approachable to experienced developers whose C# experience is only with the more recent versions. Yes, that does mean I’m currently working on updating More Effective C#. I’ll announce it here when it is ready. You can pre-order Effective C# directly from InformIT or from Amazon. I recently inherited a very complicated application in which I had to find and fix a bug. It was incredibly painful. The application contained many classes that contained other classes that contained other classes that inherited from other classes that inherited from other classes. I think you get the idea. I found the member initializers particularly painful. When code was about to create a new object, and I'd expect to step into its constructor, instead I'd end up stepping through a maze of member initializers for other classes, with no idea where I was, or why I was there, before I'd get to the constructor of the class I expected to be in. After that experience, I swore that I would not use member initializers ever, and always initialize members in my constructors, so that when stepping through the code there would be some sense of chronological order of object creation that made sense. Item 12 tells me to prefer member initializers. You give 2 reasons why: to minimize the risk of omitting an initialization with multiple constructors, and to initialize variables as early in time as possible. I guess my question is why is it important to initialize variables as early in time as possible??? I'd like to purposely delay initialization until I'm in the constructor to help debugging seem more natural, but if there is a real benefit of initializing earlier, I'd rather do that. Are there any memory use or compiler optimization benefits to using member initializers? This is a great question, because it does highlight language features, coding practices, and tools. First the language features: the C# designers made the decision that variables in an object are initialized before any code in that object executes. You can initialize a variable with a field initializer, or accept the default initialization of the 0 bit pattern. That means field initializers execute before any constructor code. As I wrote in Effective C#, initializing object fields using field initializers insures that all are definitely initialized as early as possible. I recommended initializing fields as early as possible, because it minimizes the chance of null reference exceptions. If you initialize fields before any code executes, you cannot write code that accesses those fields before you initialize the fields. The more code (even in constructors) that you may execute before initializing fields, the more likely you introduce those kinds of bugs. As code bases grow, developers may add new constructors, or add new method calls in constructors. Any of those additions can dereference unitialized fields, causing bugs. I expand on this in C# Puzzlers, where I discuss virtual method calls in constructors. However, this coding practice can make it hard to debug. There’s a little-known feature that really helps: You can set breakpoints on field initializers. It can be confusing, unless you remember the order of initialization. That’s why I went into extensive detail in Effective C# on the initialization order of objects created using C# (and interacting with VB.NET, where the order is different). It can be somewhat tricky, especially with very deep hierarchies. But, hopefully, you have to debug initialization code less often. Finally, note that the title says “Prefer Field Initializers”. It’s not an absolute rule: some fields are much more naturally initialized using constructors. But, absent good reason to pull the code into a constructor, the field initializer is preferred. The January Visual Studio Magazine marks the first time the C# Corner is written by Patrick Steele. I’ve bowed out after a long run with the magazine and its predecessors. The most important part is that the C# column is in great hands. Patrick is excellent at explaining concepts, and he’s going to bring a wealth of new ideas and concepts to the magazine. I feel much better walking away from the column knowing it is in such good hands. It was hard to walk away after so much time with VSM and its predecessors. But it was time. I’ve written on so many C# topics that I was having trouble coming up with ideas that felt new. I felt like I was covering the same ground over and over. That got me thinking about how long it had been, and what a long, strange trip it has been. I started as the original C++ Fundamentals columnist for Visual C++ Developers Journal in the 1990s. That was a new magazine published by TPD, for the MFC / C++ Developer. It were covering techniques to bridge the divide between 16 bit and 32 bit applications. There was this amazing new OS code-named ‘Chicago’ on the horizon. A few years went by. I kept covering more topics related to C++ and windows development. More MFC, ATL, language enhancements and how the Microsoft C++ compiler tracked (or didn’t track) the C++ standard. At some point in this period, Visual C++ Developers Journal was bought by Fawcette. TPD stopped being involved. The turn of the century brought more changes. This amazing new .NET platform and the C# language showed up. I started writing about C#and .NET fundamentals, instead of C++. Although the change was gradual: In the beginning, I was writing 2 C++ columns for every 1 C# column. Over time that kept changing. Next, came some initiatives to capture more of the web audience. Several of the columnists starting writing a column online (at the rate of one a week). These weren’t all tech columns. Some were more opinion, or ‘tip’ columns. That felt like quite a grind. I was constantly under deadline pressure to come up with a new idea every week. It soon got harder: The readers liked the ‘how to’ columns most. I was asked to replaces the ‘tips’ and ‘opinion’ entries with more regular columns. I took a break and wrote a book (Effective C#, the first edition). I wrote for a while, and then there were more changes. Visual C++ Developers Journal merged with Visual Basic Programmers Journal to become Visual Studio Magazine. This was a challenging time to write for this magazine. The audiences for VCDJ and VBPJ were very different. And, most importantly, they were both afraid of losing content to the ‘other’ audience. C# aficionados were concerned that they’d lose coverage to the larger VB market. VB developers felt the same fear of losing coverage to the newer, and perceived to be cooler C#. That was a tough era. The editorial staff did a tremendous job to navigate a very tough set of market perceptions. I stayed on break and wrote a second book (More Effective C#). 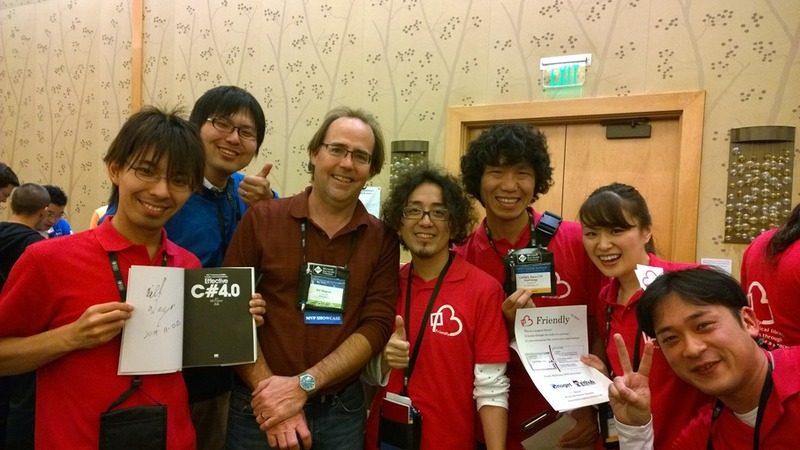 Then, I was approached to come back and write the C# Corner column for Visual Studio Magazine. Having finished the book, it was time to keep writing again. It was fun for a while. I was and still am impressed by the energy that 1105 media is bringing to the publication. I had a blast over the past two years writing for a reenergized Visual Studio Magazine. Then, while still trying to write the column, I updated Effective C#, covering C# 4.0, and other recent enhancements to the language. I was running out of ideas for the column. Visual Studio Magazine deserves better content. That’s why I worked with Michael Desmond and the editorial team at VSM to turn over the column to Patrick. I’m glad it’s in good hands. I’m now writing content for the C# Developer Center. The cadence will be roughly once a month, and I’ll be writing on current and upcoming language features in the C# language. In my last post, I wrote about the new items in the second edition of Effective C#, and those items that were removed to make room for the new items. Now, let’s discuss what happened to the items that I carried over from the previous edition. Every item received a rather significant update for this new versions. However, you won’t see that from looking at the table of contents in InformIT. That’s because the advice is very similar to the earlier edition. However, the way you implement the advice has changed significantly. As I mentioned in the last post, the C# language has made many significant enhancements over the years since the first edition was published. We have many different tools at our disposal to express our designs. That means we have many new techniques that we can use to achieve the same goals of better software, and clearly communicating our designs to other developers. In the new edition, I re-wrote all the samples to use the latest version of C#, taking advantage of all the features in C# 4.0. That does not mean I use C# 4.0 syntax in every single item. It does mean that I thought about how to express an idea using the full palette of features available in C# 4. In many cases, that meant using features available in C# 3, or even C# 2. In other cases, the samples will include some of the latest C# features. In all cases, I updated the justifications for the advice, and how to implement the goals, in the context of C# 4.0. Even if you have no experience with earlier versions of C#, you can use the advice in the second edition. Furthermore, you can use much of the advice even if you have not updated your environment to C# 4.0, and .NET 4.0. Effective C#, 2nd Edition: What Content got dropped, and why? The 2nd edition of Effective C# is now available on Rough Cuts. With that, I’ve started to get questions via email about how I decided which items to add, and which items to drop. It should be clear from the additional content what’s new: I added coverage of the significant C#4.0 features like dynamic invocation and named / optional parameters. New library additions like PLINQ are also covered. Items that are less important now. A number of the items in the first edition discussed techniques that were much more important before generics were available. Some of these items were those that discussed boxing and unboxing, the collection classes, and the data set class. All of those techniques and libraries were far more useful in C# 1.x than in the current .NET universe. Items that assumed your last language was C++ or Java. The early adopters of C# were developers that came from C++ (on the Windows platform) along with some developers that came from Java. That’s no longer true. College grads (since 2002 or so) are using C# for their first professional programming experience. Others are coming from VB, Ruby, Python, or PHP. (I’m not claiming that C# is grabbing market share from all those languages; the migration happens in all directions.) It just wasn’t right to assume that every C# developer has C++ or Java experience anymore. The poster child for dropping items is the original Item 41, where I advocated using DataSets rather than implementing IBindingList yourself. I didn’t rewrite this item because the obvious answer now is to use BindingList<T> when you need the IBindingList capability. If you were using DataSets for some other reason, pick some other generic collection type. There are many, and the options grew again in .NET 4.0. Those generic collections have better APIs (the type parameter means the compiler ensures type correctness), and better performance (boxing / unboxing doesn’t apply. It’s not often that it’s trivial to get better performance and better chances at correctness. Even in the 1.x days, I didn’t advocate using DataSets are part of a service API. That was and still is a painful choice. There’s also been many enhancements in the .NET framework that mean there are better data solutions. LINQ, along with the query syntax pattern (See Item 36 in More Effective C#), means there are much better ways to work with data in .NET 4.0. Chapters 4 and 5 of More Effective C# discuss these important techniques. The entity framework has matured, and is a better way to handle data transfer between layers and machine boundaries. (I still need to look more closely at the latest EF, I know some of the changes, but not all). All in all, I’m happy that the second edition did preserve quite a bit of the original advice from the first edition. The C# language has grown, and there are better tools in the C# toolset. It was clearly time for an update that represented the changes in the C# language, the .NET framework, and the C# community at large. If you have questions about the content, come by The Ann Arbor Computing Society (AACS) on Wed Nov 5th. That's one of the topics I'll be discussing before signing books at Borders. Update: That would be the downtown Ann Arbor Borders, on Liberty.